Another month, another new channel on the Apple TV. This time it’s Red Bull TV, which apparently features content beyond people jumping out of space. As reported by 9to5Mac, the channel—which provides video available on Red Bull TV’s website and in its iOS app—promises an assortment of live events, sports, music, and more, all accessible from the comfort of your living room. With Red Bull TV, the Apple TV now plays host to more than 30 total video services, including other recent additions like ABC, KOR-TV, and Bloomberg. But some notable content providers continue to be no-shows. For example, a CW channel rumored in May of last year has yet to materialize; ABC and PBS remain the only broadcast networks with their own proprietary apps on the Apple TV’s homescreen. 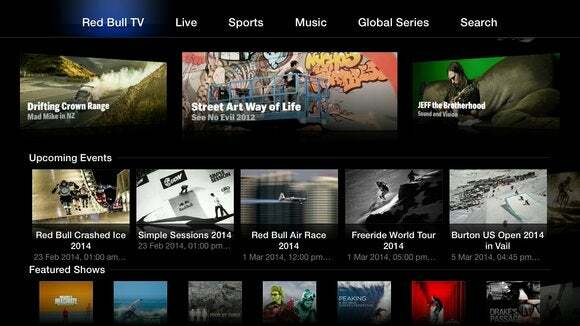 The addition of Red Bull TV also throws into stark relief the limitations of the Apple TV’s current interface. With more than 30 options, finding exactly what you want is becoming increasingly complicated. As my colleague Jon Seff and I suggested last month, there are several moves Apple could make to improve how we navigate the Apple TV. There may be hope to come, though: Recent rumors suggest that a more thorough revision to the device may be in the works, including potentially bringing games and new input methods to the set-top box. And on Monday’s financial conference call, Apple CEO Tim Cook reiterated his company’s intention of exploring new product categories in 2014, as well as continuing to iterate and innovate on the products it already makes. Either way, that could open the door to a new or revamped Apple TV in the year to come.